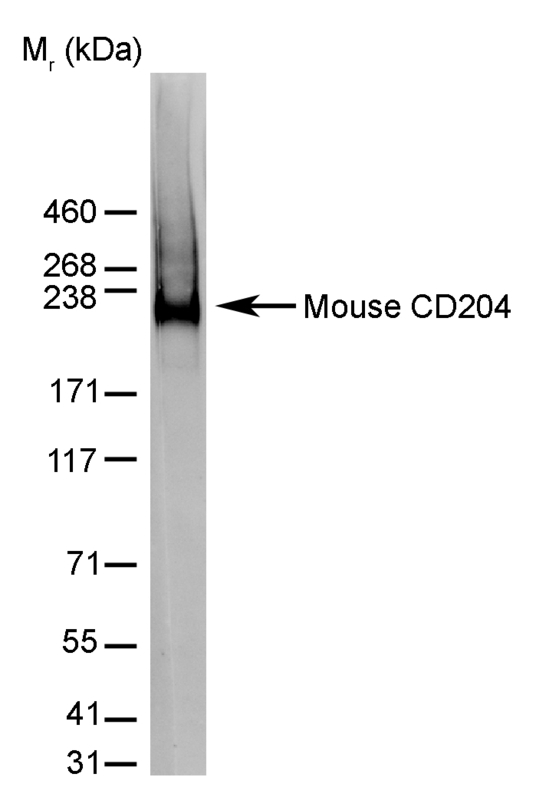 Rat anti Mouse CD204 antibody, clone 2F8 recognizes the murine scavenger receptor class A (SRA), type I and II, also known as CD204. CD204 is expressed by tissue macrophages and functions both as an endocytic receptor for lipoproteins and as an adhesion receptor for macrophages binding to ligand rich tissues e.g. atherosclerotic lesions. Clone 2F8 inhibits the uptake of acetylated low-density lipoproteins and also inhibits divalent cation independent adhesion (Fraser et al. 1993). Rat anti Mouse CD204 antibody, clone 2F8 recognizes an epitope within SRA that is polymorphic in the SRA from C57BL/6 mice. Clone 2F8 is therefore unsuitable for use with the C57BL/6 mouse strain (Daugherty et al. 2000). DO NOT FREEZE. This product should be stored undiluted. This product is photosensitive and should be protected from light. Should this product contain a precipitate we recommend microcentrifugation before use. 1The epitope recognised by this antibody is reported to be sensitive to formaldehyde fixation and tissue processing. Bio-Rad recommends the use of acetone fixation for frozen sections. 2This product recognises CD204 in J774 cells under non-reduced conditions only. The Fc region of monoclonal antibodies may bind non-specifically to cells expressing low affinity fc receptors. This may be reduced by using SeroBlock FcR (BUF041A/B). The Fc region of monoclonal antibodies may bind non-specifically to cells expressing low affinity Fc receptors. This may be reduced by using SeroBlock FcR ( BUF041A/B). Fraser, I. et al. 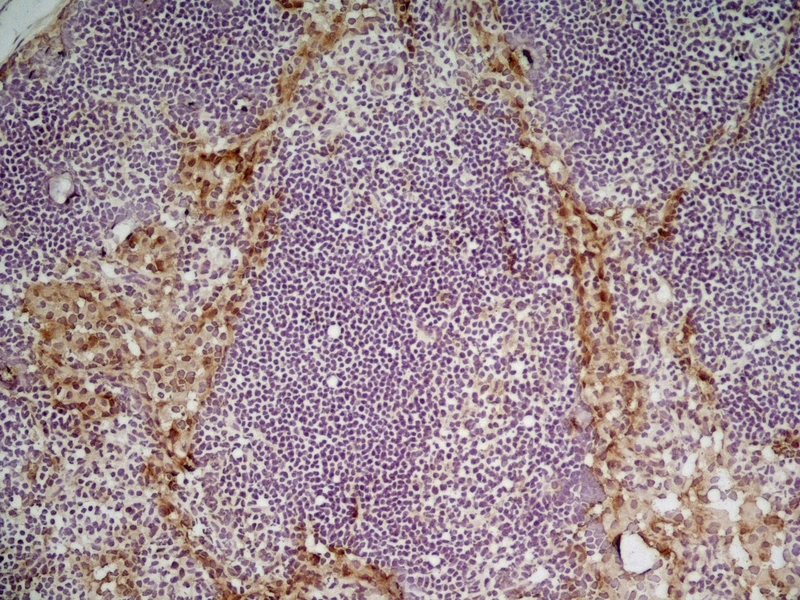 (1993) Divalent cation-independent macrophage adhesion inhibited by monoclonal antibody to murine scavenger receptor. de Villiers, W.J. et al. (1994) Macrophage-colony-stimulating factor selectively enhances macrophage scavenger receptor expression and function. J Exp Med. 180 (2): 705-9. Hughes, D.A. et al. 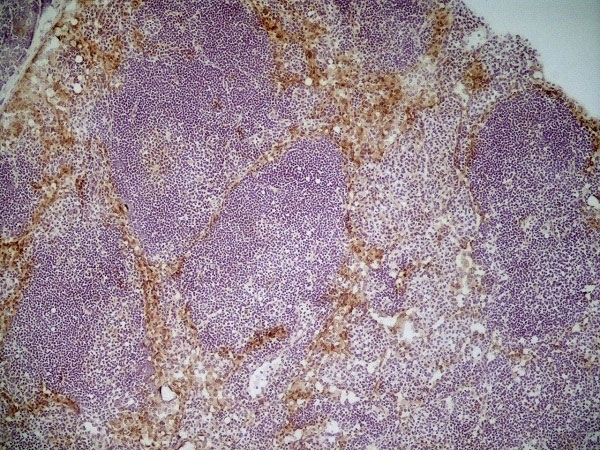 (1995) Murine macrophage scavenger receptor: in vivo expression and function as receptor for macrophage adhesion in lymphoid and non-lymphoid organs. Eur J Immunol. 25 (2): 466-73. Gordon, S. (1995) The macrophage. Hughes, D.A. et al. (1994) Murine M phi scavenger receptor: adhesion function and expression. Immunol Lett. 43 (1-2): 7-14. Aid, S. et al. (2008) Neuroinflammatory response to lipopolysaccharide is exacerbated in mice genetically deficient in cyclooxygenase-2. Daugherty, A. et al. (2000) Polymorphism of class A scavenger receptors in C57BL/6 mice. J Lipid Res. 41 (10): 1568-77. Moldenhauer, L.M. et al. (2010) GM-CSF is an essential regulator of T cell activation competence in uterine dendritic cells during early pregnancy in mice. J Immunol. 185 (11): 7085-96. Luechtenborg, B. et al. (2008) Function of scavenger receptor class A type I/II is not important for smooth muscle foam cell formation. Eur J Cell Biol. 87: 91-9. Sever-Chroneos, Z. et al. (2011) Surfactant Protein A (SP-A)-mediated Clearance of Staphylococcus aureus Involves Binding of SP-A to the Staphylococcal Adhesin Eap and the Macrophage Receptors SP-A Receptor 210 and Scavenger Receptor Class A.
J Biol Chem. 286: 4854-70. Yang, C.N. et al. (2011) Mechanism mediating oligomeric Aβ clearance by naïve primary microglia. Neurobiol Dis. 42 (3): 221-30. Hald, A. et al. (2011) MMP9 is protective against lethal inflammatory mass lesions in the mouse colon. Dis Model Mech. 4: 212-27. Swain, S.D. et al. (2011) Pneumocystis infection in an immunocompetent host can promote collateral sensitization to respiratory antigens. Infect Immun. 79 (5): 1905-14. Nikolic, D. et al. (2011) SR-A ligand and M-CSF dynamically regulate SR-A expression and function in primary macrophages via p38 MAPK activation. Zaynagetdinov, R et al. (2011) A critical role for macrophages in promotion of urethane-induced lung carcinogenesis. J Immunol. 187 (11): 5703-11. Kaur, H. et al. (2003) Identification of a scavenger receptor homologue on nonspecific cytotoxic cells and evidence for binding to oligodeoxyguanosine. Fish Shellfish Immunol. 15: 169-81. Kaur, H. et al. (2004) Single-base oligodeoxyguanosine-binding proteins on nonspecific cytotoxic cells: identification of a new class of pattern-recognition receptors. Scand J Immunol. 60: 238-48. Koronyo Y et al. (2015) Therapeutic effects of glatiramer acetate and grafted CD115+ monocytes in a mouse model of Alzheimer's disease. Brain. 138 (Pt 8): 2399-422. Nielsen, B.S. et al. 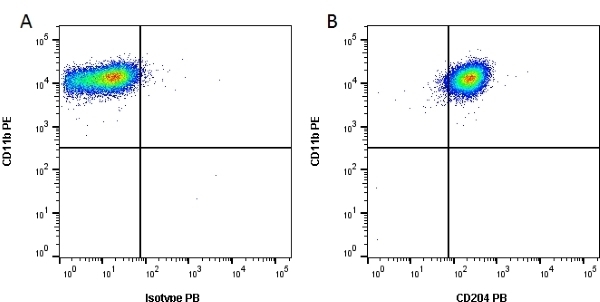 (2008) Matrix metalloproteinase 13 is induced in fibroblasts in polyomavirus middle T antigen-driven mammary carcinoma without influencing tumor progression. PLoS One. 3 (8): e2959. Tao, J. et al. (2015) ClC-3 deficiency prevents atherosclerotic lesion development in ApoE-/- mice. J Mol Cell Cardiol. 87: 237-247. Prins, J.R. et al. (2015) Unstable Foxp3+ regulatory T cells and altered dendritic cells are associated with lipopolysaccharide-induced fetal loss in pregnant interleukin 10-deficient mice. Biol Reprod. 93 (4): 95. Almholt, K. et al. (2015) Spontaneous lung and lymph node metastasis in transgenic breast cancer is independent of the urokinase receptor uPAR. Clin Exp Metastasis. 32 (6): 543-54. Verheijden S et al. (2015) Identification of a chronic non-neurodegenerative microglia activation state in a mouse model of peroxisomal β-oxidation deficiency. Kokubu, Y. et al. (2016) Induction of protumoral CD11chigh macrophages by glioma cancer stem cells through GM-CSF. Sapkota, M. et al. (2016) Malondialdehyde-Acetaldehyde-Adducted Surfactant Protein Alters Macrophage Functions Through Scavenger Receptor A.
Fujiwara, Y. et al. (2016) Onionin A, a sulfur-containing compound isolated from onions, impairs tumor development and lung metastasis by inhibiting the protumoral and immunosuppressive functions of myeloid cells. Tsay, H.J. et al. (2016) Identifying N-linked glycan moiety and motifs in the cysteine-rich domain critical for N-glycosylation and intracellular trafficking of SR-AI and MARCO. J Biomed Sci. 23: 27. Horlad, H. et al. (2013) Corosolic acid impairs tumor development and lung metastasis by inhibiting the immunosuppressive activity of myeloid-derived suppressor cells. Mol Nutr Food Res. 57 (6): 1046-54.